Actual Horn in the FORD EXCURSION-See Video. Of course this video does not do justice to just how loud this 152db Behemoth Train Horn really is!! Perfect for Large Cars, Trucks and SUVs. 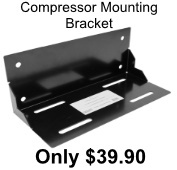 Great for RVs, OHV and Big Rigs. The trumpets are removable from mounting plate. This Horn is SO Loud it will Shake the Ground. 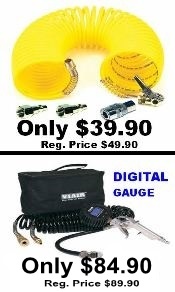 This Viair Air System can also be used for emergency tire inflate of small tires, air lockers, air springs, etc. *Trumpets can be removed from mounting plate for custom installs. 150psi (30% Duty @ 100psi). Compressor Dimensions: 7.8'' L. x 3.95'' W. x 6.35'' H.
0 to 105 PSI -----2 Min. 55 Sec. 0 to 145 PSI -----4 Min. 41 Sec. 85 to 105 PSI----0 Min. 44 Sec. 110 to 145 PSI-----1 Min. 36 Sec. We have Compressor Upgrade Options. This Behemoth-i Super Loud, earth shaking train air horn will get you noticed and will wake up inattentive drivers that share the road with you. The Behemoth-i Train Horn will work in cars, RV, SUV, Semi's and of course make for a great pickup truck air horn. The Trumpets can be removed from mounting plate. Installer can then reconfigure the trumpets into tight mounting areas of vehicle. This air horn has zinc trumpets that will not rust. The diaphragm housing are made of cast aluminum polished to a mirror finish. The Behemoth train air horn line is not for the average person, this horn is extremely loud. This Viair light duty on board air system produces a whopping 150psi. The Viair 280c compressor is 30% Duty at 100psi. and is considered light duty. The 2.5 Gallon Tank is an air advantage when using this air system. Simply put, it will have more volume air in reserve. 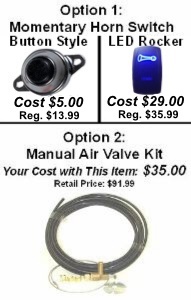 This Viair Kit is perfect for air supply for this horn, air spring kits or air lockers and even filling small tires with air. The kit includes the Viair patented air filter relocation kit. This way the 280c air compressor can be mounted under the vehicle and filter can be in a location that is clean. Ideal places for the air filter is in engine compartment or inside the vehicle cabin under a seat or under a bed rail is also ideal. This will extend the life of the compressor greatly. This Viair heavy duty kit includes a 110psi ON and 150psi OFF pressure switch which allows the air system to always maintain proper air pressure in the tank. This kit includes all the necessary fitting for install. 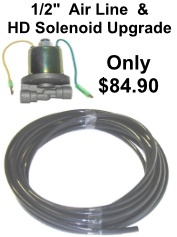 Get a little more from this Behemoth horn when you upgrade to larger tubing & air valve(solenoid) and all the needed fittings. The larger tubing and solenoid allows more air volume means little louder the horn.